I left Beatty, Nevada, in the late morning and headed west towards Death Valley. My trip had started earlier that morning in Las Vegas. I was cruising along at 65 with the top down and the music cranked up loud to counteract the noise of the wind. I drove over Daylight Pass and continued down into the park. The road from Beatty ended at North Highway where I turned left and, after a short distance, reached the junction of rte 190. I took a right and quickly covered the long stretch of road that ran past the Dunes Area, then drove slowly through the small village of Stovepipe Wells. Climbing steeply towards Townes Pass, I took a left on the Wildrose Road, and followed it south and up towards Wildrose. I drove past the Skidoo Road and stopped at an overlook about two miles above the Wildrose Campground, where I got out of the car to stretch and enjoy the view. From the overlook, I took a picture of the two rounded summits of Wildrose Peak and standing just to their right, Telescope Peak, the highest summit of the Panamint Range and the roof of Death Valley National Park at 11,049 feet of elevation. I also took a picture looking down into Panamint Valley far below and to the west. I returned to the car and continued down, stopping just after Wildrose Campground to put the top up. There was a dirt and gravel road ahead and I did not want to collect the dust that I knew the car would raise, but the truth was that I was also tired from the heat and the sun after driving through Death Valley during midday in the summer. I crossed over the rough portion of the road and took a left turn on the Panamint Road, rte 178, where it came in from the north a short distance south of its terminus on rte 190 near Panamint Springs. 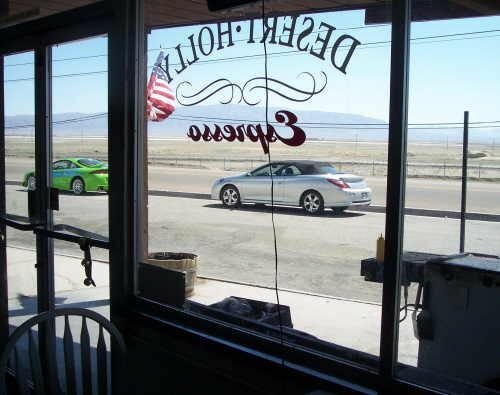 The car was now heading south toward Trona and Ridgecrest, and the road stretched away in a straight line until it disappeared in the distance. I took a picture of the road ahead through the windshield. It was now after noon and I was tired from the heat and driving. The road now veered to the west and crossed over a ridge into the Searles Valley north of Trona. Trona's fame lay with the potash and other minerals that it harvested from the harsh desert landscape. Many houses along the road in Trona lay abandoned and boarded up, and when you drove through town, you couldn’t help but think that the town was on the brink of its demise. 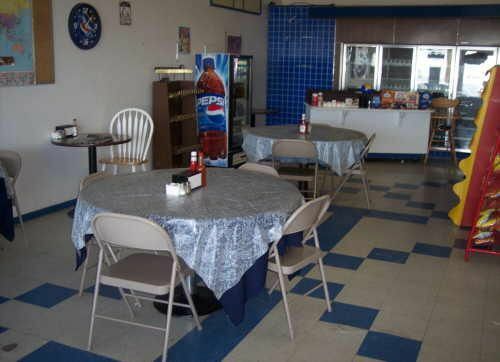 There was a soda shop in Trona where I had stopped before, and I wanted (and needed) a rest stop before continuing on to Los Angeles. As I slowed and drove into the town, I noticed a small handmade sign propped up on the side of the road that said “Espresso – 3 miles ahead”. The thought of a cold caffeine jolt sounded good to me right then, so I passed the familiar soda shop and kept a keen eye out for the unknown coffee house somewhere ahead of me. “Yes it is,” I answered with the same enthusiasm, and walked through the door to enjoy the coolness of the interior. A line of bottles with various flavorings stood on one counter. 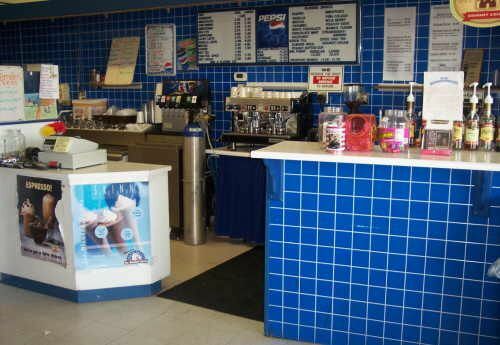 Blue tile fronted the counter and covered the wall behind the cash register and espresso machine. I did not see it on the menu, so I asked a young man behind the counter if he could make me a double iced Americano, and he nodded his assent. In a couple minutes, I sat down with my cold drink at a small table near the wall with two small metal folding chairs set on either side. The drink was delicious, and I felt myself dozing as I leaned my back flat against the wall behind me. An older couple came in and, after getting cold drinks, sat at a table located at the front window. The young man continued to work away outside. 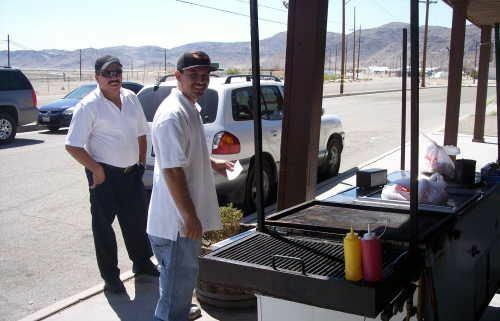 Cars pulled up, people of various ages and backgrounds got out and talked with the man in front of the store, and then left with bags of food that the young man had prepared on the grill. He came inside with two paper plates and set them down in front the retired couple. 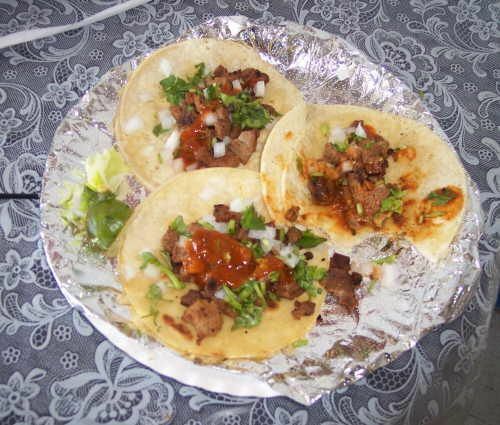 The plates held simple tacos, and they both squeezed fresh lime wedges over the food. Some cars just stopped out front, and he passed them bags of food through open windows. The older couple finished their food and left. A young woman walked over to clean the table and I asked her what he was cooking outside on the grill. “Small corn tortilla tacos, large flour tacos, and burritos,” was the answer. I walked outside and the man turned to face me. “This your place?” I asked him. I introduced myself and extended my hand; he removed his sanitary cooking glove and accepted the offer of my hand. “I’ll take three of those small tacos,” I said. “Pork, chicken, or steak?” came the question. “Make it the red,” I answered. 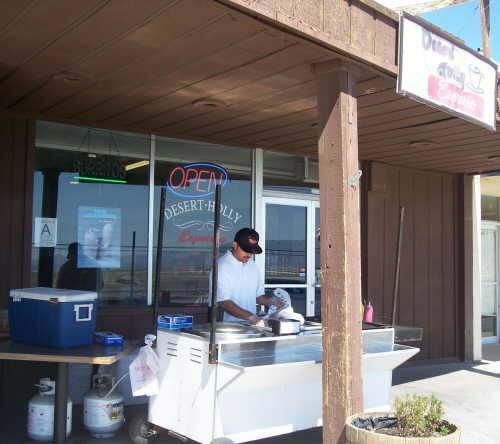 I began to realize what a special place this was, this coffee and taco stand trying to make it in the hardscrabble mineral desert of Trona. I told Carlos I was going to my car to retrieve my camera. I returned and took some pictures of Carlos working out front, then went inside and took some pictures of the interior. I met the young man who made my Americano earlier; his name was Tony. The young woman was Carlos’ wife, Eileen. I took their picture as they worked behind the counter. Carlos delivered my plate of food, three small tacos on hot grilled corn tortillas with steak, onion, cilantro and red sauce. I squeezed fresh lime over the tacos and took a bite. Awesome. I took a picture of the meal, and then sat down to savor my repast. 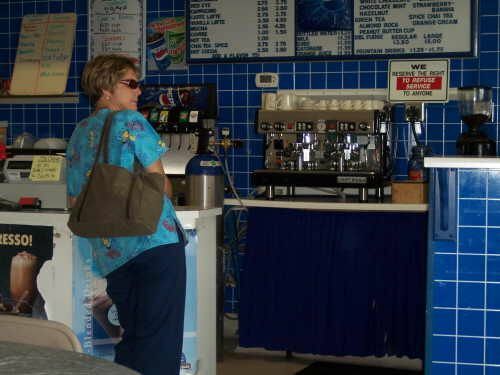 A woman came in to order a cold drink. She looked stoically out the window to the desert beyond. I took her picture. I asked her if she was a regular, and she turned and gave me a warm smile, and then answered that she was indeed a regular. I took her picture again, and asked her for her name. “You live in Trona?” I asked. “What cold coffee drink do they make here that is really good?” I asked. “Order any flavored blended espresso drink. 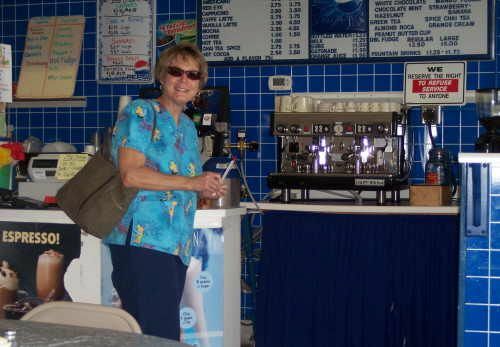 You won’t get better at any expensive coffee bar, I guarantee it,” she answered. Barbara left, and I ordered an iced blended caramel espresso to go. I got up and paid my bill. I said goodbye to everyone, and took one last picture of Carlos working out front as I left. 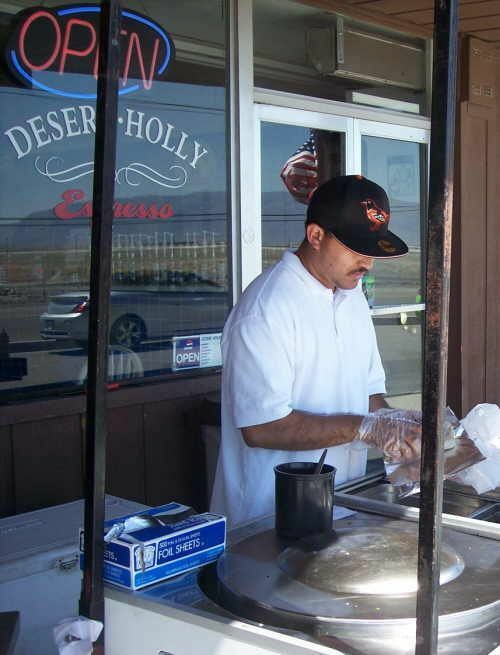 What a wonderful stop this was, this precious and friendly desert oasis run by a proud Carlos Esparza and his wife, and located in the town of Trona to boot. I was happy and refreshed, and ready for the final pull south to LA. Like everything in life, you must be ready for new experiences and try your options. You never know when you may come across a real jewel.